Steven Schnipper, MD (New Rochelle) - Book Appointment Online! 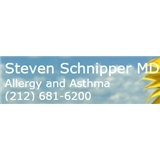 Dr. Schnipper is a caring physician who has been providing personalized allergy care to adults and children for more than fifteen years. He treats the full spectrum of allergic diseases, including asthma, hay fever, sinus disease, hives and food allergies. Dr. Schnipper accepts all major insurance plans, and has convenient morning and evening hours. Doctor was very kind and knowledgeable, the office seemed a little outdated tho.